Some years ago, I was on holidays in Agadir, Morocco. It was an interesting couple of weeks in that I became acutely aware of being female – something I hadn’t really given a whole lot of consideration to – after all, I’d been one for over 50 years. This was brought to my attention by the unrelenting remarks directed at me (and other women) by many and varied unknown men. This permeated through the holiday, which unfortunately made me feel increasingly more uncomfortable. I was quite aghast when a man I’d been chatting to amiably for some time refused to shake my hand as our conversation ended. I was told later that touching women was considered unclean by some men. So, by the second last day of my holiday, my nerves were a little edgy. I went on a bus tour to visited a Souk. These are large meandering markets which sell anything and everything. I think it was in Gadir, though I cannot remember exactly. Perhaps someone can recognize the walls surrounding the city in the image below. I’d love to know for sure. I’d finished looking around earlier than the allotted time before our bus left for the journey back to our hotel. 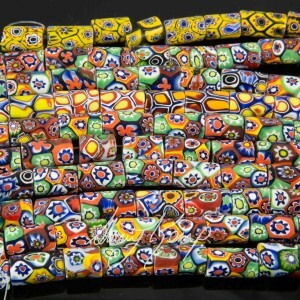 As I had some time to spare, I asked our tour guide if there was anywhere amongst the Souk that might sell old beads. He gave me directions, so off I went. After the inevitable navigational failures, I found a very small ‘shop’, which was more like a tent. It was quite dark and filled with all sorts of musky smells. There was stuff hanging from every available square inch and had tables of different heights and widths. I mooched through the varying strands of gemstones, old and new jewellery and general bric-a-brac. 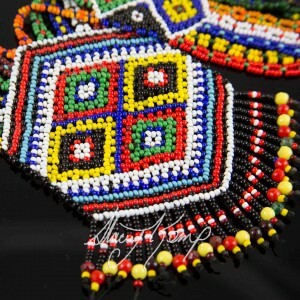 I noted there were many newly made beaded items for sale too. 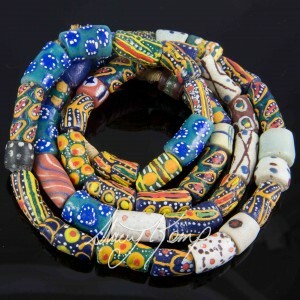 I picked up a few strands of “Trade Beads”. 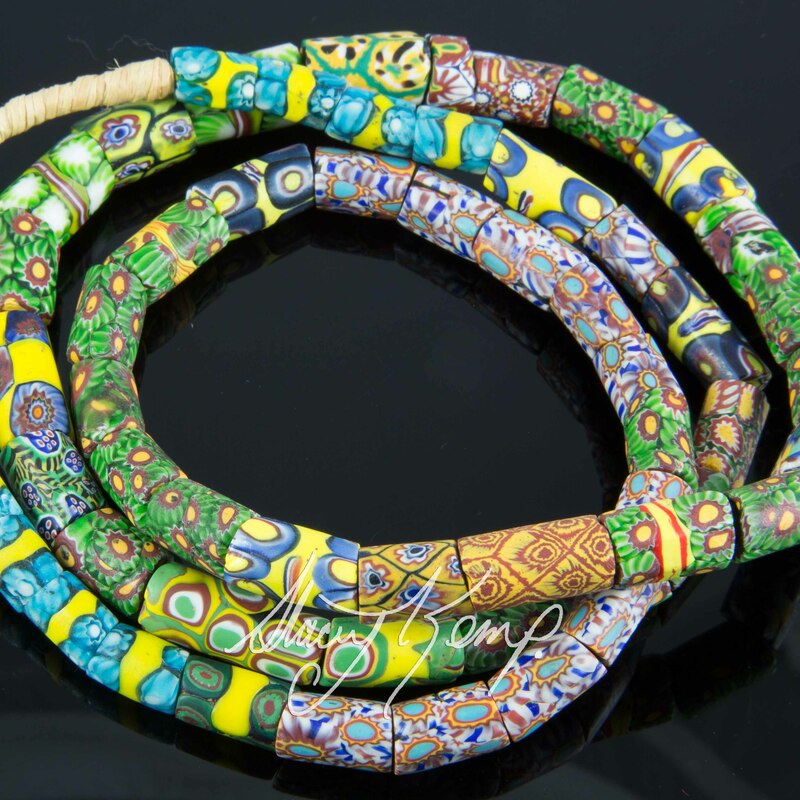 These ones were painted on top of a combination of glass and clay beads. I have a strand of genuine Trade Beads picture below, at home and a strand of some modern imitation millefiori ‘Trade’ beads too,pictured centre. 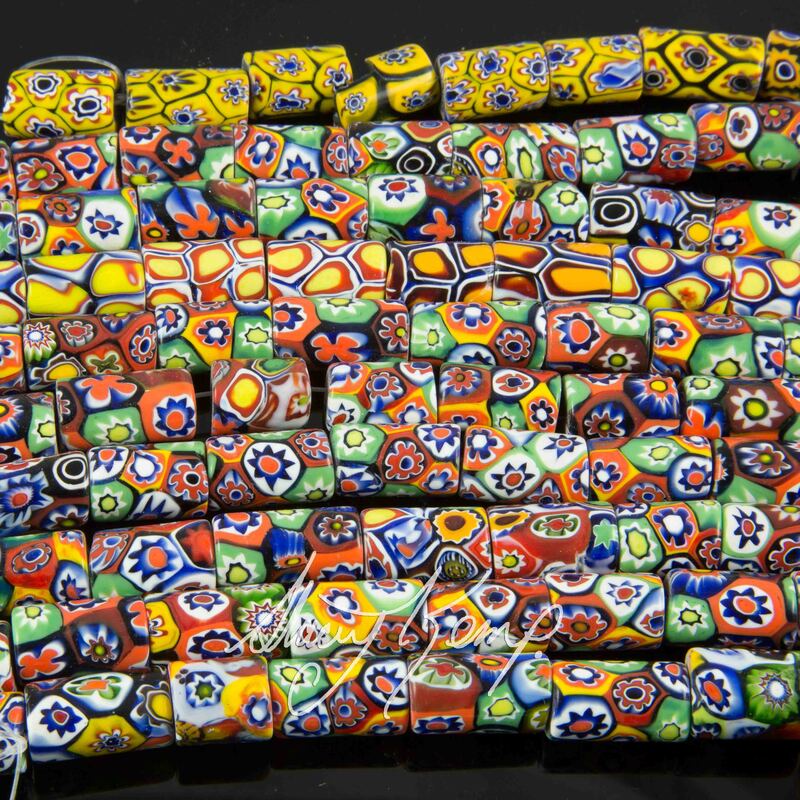 I inspected the beads in hand and determined that, while their productivity offered a limited skill, they were not millefiori (meaning a thousand flowers) glass Trade Beads. They were quite clumsy in their execution and made of a clay and or glass, top picture. However, I liked them for what they were, and I gave thought to the hands that painted them. There were some netted beadwork items for sale too and the beads used in them reminded me of the beads in my stash of seed beads from the 1970’s. Again, I felt a certain camaraderie to their creators. I asked the owner, a cheerless individual, if they were old. Yes, he said, about 20 years old. I asked him where they were made. He pointing to the ground. I concluded that they were made locally. His English wasn’t great and my Moroccan wasn’t great either. The little tent was unnervingly quiet considering the hustle and bustle around the Souk. After a while I was getting that awkward feeling again.The stares from the trader were singeing my back. I was on the cusp of leaving the tent when I had decided I would buy the items mentioned, in a way, to support the people who made them, as much as anything else. Then I saw a strand of shells, hidden away amongst a large assortment of other strands. My beady eyes honed in. They were old and on touching them, I felt I was holding some history. I don’t know why I felt that way but there was just something about them. They were grubby and had clearly been around the block a few times. They felt like they could do with a really good wash. 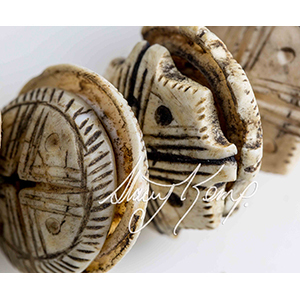 They had distinctive patterns carved into them, perhaps with a penknife or such an implement. 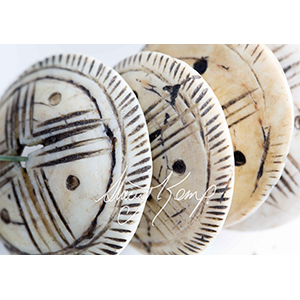 The etchings were slightly different even within the shells that had the same pattern. All were about 4 cm in diameter and had the same swirl shape underneath each shell. I felt a profound connection to them. I knew right then that they had to come home with me. I cunningly hid my excitement when I asked how much they cost. Reservation went out the window – “How much”, I asked incredulously, in a higher pitch than I’d intended. He repeated the amount without a smile. I put them back and there they stayed. Damn, I thought. I really wanted those shells. But that was way too much for me to spend. The one thing I’d picked up from my trip to Morocco was that tourists were fair game. I returned to the other pieces I’d looked at earlier – the faux Trade beads, the contemporary beadwork and a few other bits and pieces. With every piece I picked up, I asked the price. When he told me, my face looked like I’d just sucked a lemon. I amassed quite a few items, putting them beside his cash register, always asking the price. I greeted his reply by looking down, shaking my head and making a grumpy face (remember – I’m in a mans world now). We danced around like this for some 20 minutes. Eventually, I nonchalantly tossed the shells into the mix and asked how much for the lot. I began returning the items. “€500.00”, he said to my back. I looked over my shoulder – “€100.00”, I said without smiling. – His turn to look like he’s just sucked a lemon! “No no, no, no”, he said, head shaking violently. “Ok, no problem”, I replied and I continued to return the gear. “€400.00”, he offered, after some time. I turned around, looked him in the face and suggested €150.00. He was not a happy bunny. ‘€350.00’, he stated, with a straight face. Again I paused – “€200.00”, I replied equally straight faced. €250.00 he said with more than a little irritation. I reassembled my bootee, the shells first, with the skill of a squirrel, paid him and scarpered. My heart was pounding, not least because I found your man quite scary but also because I was so pleased with myself and I was half expecting a tap on the shoulder. I only got lost a few times on my way back through the labyrinth of narrow streets – quite an achievement for me. In my haste to get out of that tent, I neglected to ask what the shells were about. I showed my haul to our tour guide back at the bus. He’d been able to answer just about every question thrown at him so far, no matter how obscure. Maybe he could help me out too. He looked through my plastic bag without much interest. He picked out the carved shells. “Oh, these are very rare”,he said, scrutinising the shells. “They are rare because they were systematically destroyed whenever seized to prevent the slaves from using them. “I’ve seen one or two before”, he said. A wave of chattering tourists emerged from the Souk, who started piling onto our bus. The tour guide handed me back my stash and began his duty of attending to the tourists. Sitting on the bus on my way back, I looked into my bag of oddments and turned the shells over one at a time. My imagination went into overdrive as I pondered the many many stories each shell could tell, the people who handled them, the clandestine deals and the inevitable struggles of those who possessed them. How things have changed a 100 years on. How things haven’t changed a 100 years on! Today, those Conus shells rest about a meter away from me as I work. They remain exactly as I bought them – unwashed. They are a reminder, on many levels, of how fortunate I have been. They are amongst my most treasured possessions.